October 24th, 2018 - The Source screens "The Dawn Wall" to our largest crowd yet. Thanks to everyone that came out to support the Kiggins, our favorite local community theater! October 3rd, 2017 - NEW Equipment on Fitness Level. The Source now offers 2 Ellipticals, Rower, squat rack and full range of free weights for members to train. June 16-18, 2017 - 14 members of the Source Climbing Team have travel to Anchorage, Alaska to represent The Source at the 2017 Sport&Speed Divisional Championship. November 10-11, 2016 - The Source rounds out 5 years of climbing and community on Main Street with a showing of ReelRock11 at the Kiggins and a night of celebrating with high slacklining, augmented reality climbing, athlete slideshows and more. Thanks to everyone that came out to celebrate! October 16, 2016 - The Source now offers climbing shoes! Check out the selection BUTORA and LA SPORTIVA in our pro shop area. October 2016 - Northwest Meetings & Events magazines features Vancouver, WA and The Source as "What to Do. Where to Go." February 2, 2016 - The new FITNESS LEVEL is opened featuring a treadwall, HIT system and Functional Training equipment. May 27th, 2015 - Willamette Week recommends "best reason to come to (the Source) is the friendliness of the employees". Read more. May 9, 2015 - Our 3rd USA Climbing Regional competition is a big success. More than 40 volunteers made everything run smoothly, and 5 members of the Source Team advanced to Divisionals! Check out the Columbian article. May 4th & 7th, 2015 - The Source is featured during the LIVE morning news on both KGW and FOX. December 11, 2014 - Another new climber born! Co-owner, Hanz and Caroline welcome Asha 'Capitan" Kroesen to the Source family. June 24, 2014 - A new climber is born. Co-owner, Michael and wife Crystal, are now proud parents of Aden Christopher Lary. March 3, 2014 - Josh Hulbert becomes the first Source Team member to compete at Nationals, placing 27th. That's 27th best climber for 11-12 yrs old in America! We're very proud of him. December 5, 2013 - The Source earns designation as a Clark County Green Business! November 11, 2013 - Source Instructors, Michael and Bryan, are now officially registered as Boy Scouts of America Merit Badge Counselors in the Ft. Vancouver District. 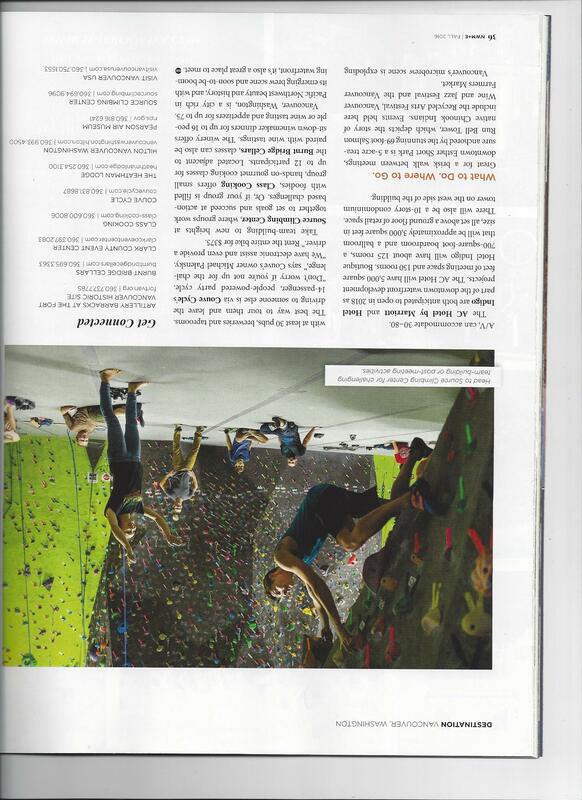 May 11, 2013 - The Source hosts it's first USA Climbing Regional competition. A big THANK YOU to our 50 volunteers along with more than 100 competitors and families that made this a great event! May 8, 2013 - The Source is on TV! Drew Carney from KGW Channel 8 visits the Source to learn more about the upcoming USA Regional Competition. January 1, 2013 - Featured in Portland Monthly! November 10, 2012 - The Source and 300 Climbers celebrate the one-year anniversary with a Reel Rock 7 screening at the Kiggins Theater followed by an after party with climbing, high slackline, "bench bouldering" and refreshments. April 27, 2012 - Featured in the Vancouver Business Journal as the Startup of the Year! April 26, 2012 - The Source is named 2011 Startup of the Year in the Business Growth Awards presented by the Vancouver Business Journal, SCORE, & Riverview Community Bank. March 9, 2012 - 300 people pack the Kiggins Theater to watch the 2011 Reel Rock Tour sponsored by The Source. After party at the Source gives members their first chance to try the high slackline. February 7, 2012 - First TruBlue Auto Belay systems are purchased. December 2011 - First Source Gives Back event. 23 youth between the ages of 13 and 17 from Clackamas County enjoy climbing for the first time during this free climbing event. November 16, 2011 - Featured on FOX12 Good Day Oregon. Watch Joe V climb the Source walls. 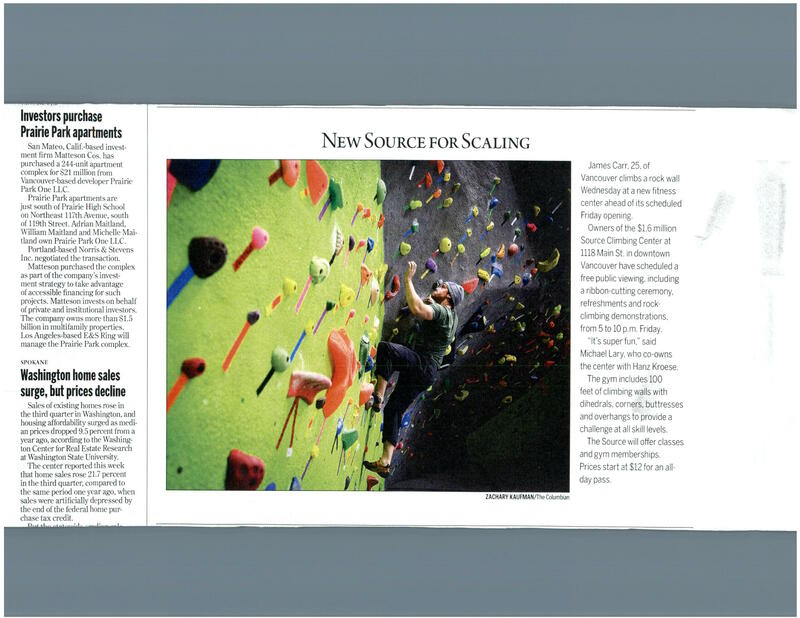 November 11, 2011 - Feautured on the front page of the Columbian's Business section, entitled "New Source for Scaling!" November 11, 2011 - Grand Opening. Over 350 people join the founders, Mayor Tim Leavitt, and the Vancouver Downtown Association for an evening of climbing and celebrating Vancouver's own Source Climbing Center! November 8, 2011 - Founding members get their first chance to climb the new walls! 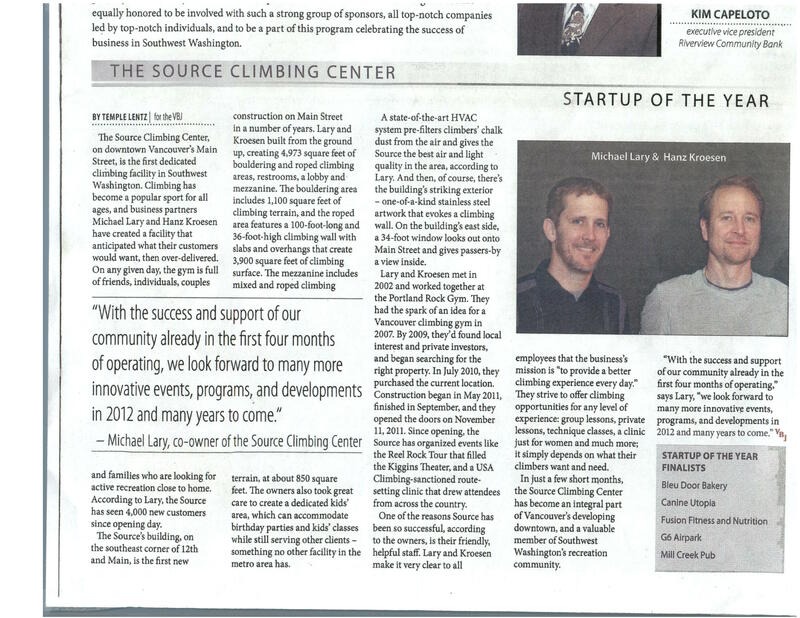 October 7, 2011 - The Source Climbing Center signs up its first founding member! October 4, 2011 - Steel framing of the climbing wall is complete. Construction is on schedule! September 19, 2011 - New SourceClimbing.com site released with pricing and program information. August 29, 2011 - Eldorado Wall Company arrives on site. Climbing wall construction begins! May 9, 2011 - Ground Breaking. Construction begins on the gym facility. March 2010 - Source Climbing Center, LLC founded. August 2010 - Site at 12th and Main, downtown Vancouver purchased. March 2009 - Climbing Managent Group, LLC. founded to develop property for Vancouver's own indoor climbing facility. 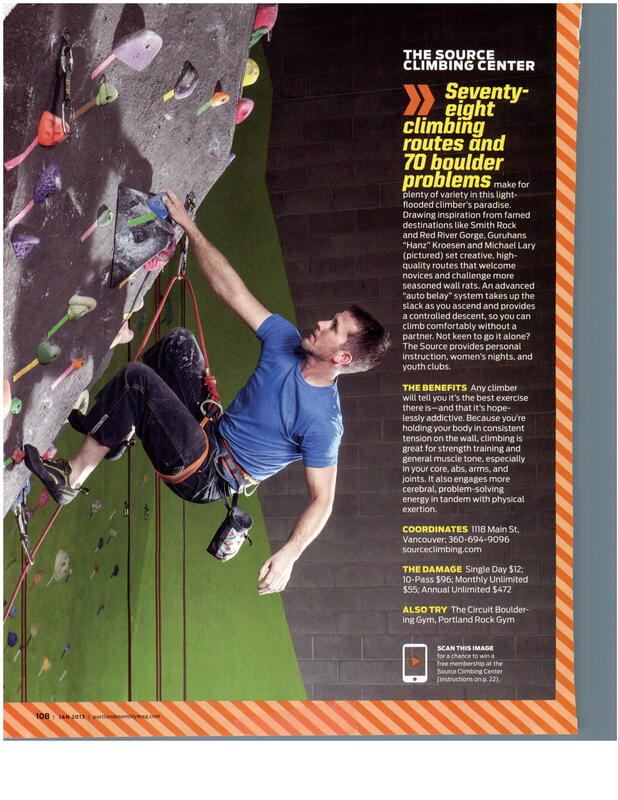 May 2007 - Founder Hanz Kroeson asks co-founder, Michael Lary, "Hey, what do you think about the potential for a climbing gym in Vancouver?"